The TS 95 walk-behind unit distributes material in a controlled pattern to reduce waste and prevent material from being applied to unwanted areas. It features a corrosion-resistant polyethylene hopper with a 120-pound capacity. 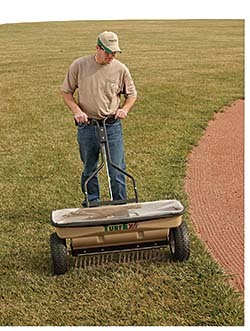 The spreader can distribute a variety of granular materials, including fertilizers, pesticides, herbicides, and seeds in a 28-inch-wide pattern. The material flow rate is controlled through an adjustable gate. Larger tires enable the spreader to tackle any terrain, and the cover protects material in the hopper from moisture.